A lot has been said regarding Ken Liu's The Grace of Kings. Some of it good and some of it decidedly bad. Although the novel garnered a slew of rave reviews, it remains a divisive works among readers. A quick perusal of online ratings and reviews shows that lots of people didn't like it, and some of them did not even finish it. This being the author's first novel-length epic fantasy project, I figure it was to be expected. Given the fact that Liu won virtually every genre literary award out there for his short fiction, I knew I'd read the book at some point. My biggest concern was that most of the rave reviews came from the SJW speculative fiction clique. Which is why it took me so long to finally give The Grace of Kings a shot. Though reticent, the promised Asian setting that gave epic fantasy a much-needed breath of fresh air, as a fellow fantasy writer opined, intrigued me and ultimately enticed me enough to sit down and read it. Right off the bat, I need to elaborate on that Asian/Chinese setting. This was, for me at least, one of the biggest selling points about this novel. I was expecting an environment with a political, social, and historical backdrop as researched and well-executed as those found in quality works of fiction like James Clavell's Shogun and its sequels, or Guy Gavriel Kay's memorable Under Heaven and River of Stars. Unfortunately, other than the occasional custom or food item, or the names of places and characters, very little about the setting and the traditions truly felt Asian or Chinese. This was extremely disappointing. I mean, when you read something by Nnedi Okorafor, the African setting influences every single aspect of her stories. Given his background, I was expecting Ken Liu to come up with something akin to that in terms of depth and authenticity. Problem is, this Asian setting, which was supposed to be a world away from the habitual medieval European environment that has become the norm in the genre today, was a bit half-assed. Unlike the aforementioned Clavell and Kay titles, novels in which everything down to the last minute detail reflects the Japanese/Chinese way of life and customs, as was the case with Kate Elliott's Black Wolves very little in The Grace of Kings feels different from other fantasy works on the market today. One of the book's most annoying shortcomings according to readers has to be the omnipresent POV style. It takes some getting used to, but in the end it wasn't as much of a problem for me as it turned out to be for other readers. It does create a narrative structure that can be off-putting, though. It relies on massive info-dumps to convey information to the reader which have a tendency to kill whatever momentum the novel has going for it. Every time a new protagonist is introduced, a full back story is immediately provided and can last for several pages. Personally, I prefer to get to know characters by increments and see events unfold before my eyes in sequences. Hence, that narrative approach took something away from my overall reading experience and I can understand why it totally killed it for some people. In scope and vision, some people claimed that The Dandelion Dynasty was similar to Steven Erikson's The Malazan Book of the Fallen and Brandon Sanderson's The Stormlight Archive. Nothing could be further from the truth, at least based on this first installment. Though the worldbuilding can be original and inventive, The Grace of Kings is fantasy "light" for the most part and simply cannot compete with epic fantasy's signature series for the time being. True, there are elements that hint at a more ambitious story arc that might resound with more depth. Time will tell if Liu can elevate his game and bring The Dandelion Dynasty to another level. Also, the relative absence of magic and the level of technological advancements make certain plot points like the tunnels and the submarines appear ludicrous. I know this is fantasy, but a certain level of realism needs to be maintained. In addition, many aficionados stated that this is a literal retelling of the Chu-Han Contention. Hence, anyone familiar with Chinese history may find it difficult to get into the novel. Finally, there is an entire pantheon of gods that get involved in world's events. Which means that there are a number of Deux ex Machina moments that kill whatever tension build-ups Ken Liu managed to sustain. The characterization leaves a lot to be desired. The info-dumps that characterize the narrative structure make it hard to relate to many of the protagonists. The two principal perspectives are those of two immensely different men. Kuni Garu is a scoundrel with a do-gooder's heart. Think of an Asian version of Mat Cauthon with a beer belly, wearing a Che Guevara T-shirt. Mata Zyndu is an 8-feet-tall unstoppable killing machine. Imagine a stiff-necked and stubborn-to-the-death Jeovah's Witness with the body and the strength of Karsa Orlong and the invulnerability of Drizzt Do'Urden. In many ways, Mata is a veritable caricature and it's impossible to connect with him. The love/hate relationship between these two protagonists doesn't always make much sense. And since this relationship is at the heart of the tale that is The Grace of Kings, in the end it hurts the plot in a myriad of ways. To a certain extent, this book is an ensemble of vignettes featuring the perspectives of a number of men and women and gods. But these many narratives often create an incongruous whole. Moreover, the depiction of women is definitely so-so. Jia Matiza, the main female character, spends the years spawning this novel picking herbs, getting pregnant and having babies, encouraging her husband to take a second wife for the good of the realm, getting jealous of the other woman, reconciling with the fact that this needed to be done, etc. She basically only exists to allow Kuni's storyline to progress. Gin Mazoti, who'll become Marshal of Dasu, is little more than a token female warrior. Given her importance in the resolution of the conflict, one would have thought that her portrayal would have shown her as a more complex and well-drawn protagonist. Due to the number of info-dumps and the vignette-like structure of the narrative, it's no surprise that The Grace of Kings suffers from pacing issues. Weighing in at 623 pages, this is not a slender book. I have a feeling that it would have benefited from excising a few scenes and even full chapters that brought little or nothing to the plot. Although he won multiple awards for his short fiction, the author needs to learn to better pace his novel-length material. Still, given its size, thanks to Ken Liu's evocative prose I went through the novel in a few short days. Regardless of its flaws, The Grace of Kings recounts a compelling tale and you want to find out how it all ends. And while the endgame was nothing to write home about, the ending itself was quite satisfying. 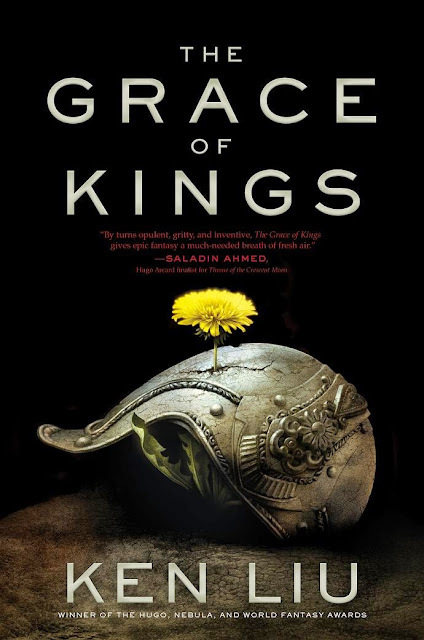 Though The Grace of Kings was far from perfect, there is something about the plot and the worldbuilding that makes me want to discover what happens next. Hence, I'll surely give the sequel, The Wall of Storms, a shot. However, I'm not sure I'll stick with it until the end if Liu has not improved his game in the aspects of his writing that showed the most flaws in this first volume. . .
What does "came from the SJW speculative fiction clique" mean? Great review! I agree you about all your critiques but I ended up loving the book anyway. I grew up with stories from the Romance of the Three Kingdoms and the writing style and pacing Liu has employed feels exactly like the stories of my childhood. Those stories had this weird balance of being both fairy tale and historical account and to me it feel that Liu was trying to channel that energy. @Anonymous: SJW means Social Justice Warrior.